This is one of my favorite chapters. Before we start making too many changes to our practice, let’s take a moment to recognize where we are. These surveys are a great way to start being mindful and aware of yourself as a practicer, performer, and person. They help examine larger patterns in the very long, detailed, and slow-paced journey on our instruments. I try to do this big picture evaluation regularly, just as we regularly evaluate our progress with a piece in the practice room. Focus tells us where we need to work on your focus ability (maybe everything, maybe just performance, maybe just practice) so that we pick the the most immediately helpful kinds of focus practice. Not answering a 5 doesn’t mean you can’t improve or that you can’t decide to move something to a 5. The accurate feedback about where your time and mental energy are going is crucial to planning for the future. Music students have countless demands placed upon them and that feeling never changes. This survey is a great way to check in on how you are balancing those demands. But again, marking everything or nothing as a 5 does not mean you will or will not succeed. You can put all the effort you want into unhelpful practice strategies and it would be hard to succeed. Conversely, you can realize you need to change some priorities in your practical realization of practice and start to see much more improvement. Moving and keeping more of these answers to a 5, is a sign you are on the right track and one of many components to success. Let’s use this to look for patterns in your focus habits. I’ve been working a lot on focus, so I was generally satisfied with my performance focus. However, I noticed my focus in practice sessions decreases as the week continues. I have great Mondays and then just average other days. I was having a hard time keeping the urgency of learning to play clarinet when I saw the improvement I was hoping for on Monday. I started mixing up my practice schedule so that I see some of my pieces every day, but others less-frequently. Rotating repertoire keeps me from getting bored but also puts a time-pressure on me because this excerpt may not be in my roster for the next day or it was not the day before. Are you prioritizing more fun, shorter-term, or less demanding tasks over something as immersive as practicing? I noticed I put some other homework assignments ahead of practicing because they have a specific deadline and it’s easy to see progress and feel like I’ve accomplished something. Crossing a 2 page paper off my to-do list feels better than practicing scales or long-tones or the same etude again–even though I need that practice time. This tells me I need to be careful about how I make my task lists and how I organize my day so that I can prioritize practicing. This also works for organizing your actual practice time. You can use it for technique basics, for how much time you are spending on different aspects of repertoire, for how much time you devote to practice vs. performance work, or anything else you want to keep balanced. Think about your fundamentals–articulation, tone, pitch, rhythm, whatever is important to you. In the practice room I realized I’m willing to let my sound suffer when I play on softer reeds because I don’t prioritize breaking in reeds over actual practicing in sessions. There is nothing inherently wrong with most decisions, the important part is to make sure your choices reflect your goals and values. My sound was not terrible, just a bit brighter than I prefer and I was accomplishing a lot in that time. However, I was, in effect, prioritizing practice time over always having a good sound. If I value tone (which I do!) and I need reeds to create a good tone (also true), I need to start valuing reeds. If we are prioritizing the wrong things, how can we change it. In a combination of all of these, I reexamined my focus within practice sessions. I work hard give myself good practice time and conditions, so sometimes it’s easy in 1 of many sessions in a many days to not consider a 5 minute period vital enough to be motivated to focus..there’s another 5 minutes coming. But when I remind myself that I want to focus because I want to improve because I want…etc, it’s a great way to keep myself on track. My time can feel valuable and urgent without necessitating stress or anxiety. I LOVE these charts and they are adaptable to any issue you might be facing. Improving starts with accurately evaluating where you are compared to where we want to be. Ideally we would all have focused, incredibly productive, and enjoyable practice time every single day. I don’t know that that is possible. But when we pay attention to what is happening, we can change our practice experience for the better the same way we change our playing ability for the better. So far, I used them 1) for staying positive and learning-focused and 2) for tracking my focus during practice. For staying positive, I tried to note any time I switched from objectively evaluating and problem solving (“That was not good tone, what can I change?” “that rhythm was incorrect, how can I practice it differently?” “I was not using my air efficiently, what exercises can remind me of good support?” “my tonguing needs to be lighter, maybe I can think about supporting my tongue with my air,” etc) to something negative, final, and not learning-focused. “That was not good tone” can lead to curiosity-based problem-solving as above, or it can lead to “my sound is bad and it’s not getting better, so I can’t figure out how to make it better, so it can’t get better, and therefore I will never be good enough on the clarinet.” Thoughts like these precede a lot of my most frustrating and least productive practice experiences. No matter how I try to improve those days, my negative headspace impeded my time with the clarinet. Tracking these thoughts helped remind me stop the flow to negativity and redirect to learning. 2. For focus, my experience was a bit different. I tried to note every time I had an errant thought in practice (just by adding a tally mark on a post-it). In addition, I separately tracked all the times I was distracted and acted upon that distraction (checking my phone, talking to my neighbor, adding something to my to-do list, etc). In addition to tracking my focus, taking notes of my distractions made me a bit more accountable. Reminding myself that I want to focus on my practice more than on my distractions helped motivate me to not pick up my phone every time I was tempted by the thought. The main reason to not focus on negative feelings is, as Orlick explains, that it means it is impossible for you focus on the actual task of performing. But I think just as significantly, that bad feeling is not necessary for improvement so why would we want to feel it? Nothing good comes from dwelling on it so we should not. I wonder too if there is a sense of self-punishment among performers in these circumstances. “I played badly so I better feel badly now to motivate myself to play better next time.” Or perhaps there is guilt for not giving your best to other performers, collaborators, or audience members. It certainly takes practice (as any skill does) to be able to return your focus to the task from that worry. Do you, your colleagues, or students ever feel this way? I have, and I have (in my own performance experience) seen peers do this to themselves. But I think a recognition that you never deserve to feel badly is important too. However, we can learn by evaluating what went wrong and why without the negative emotional trauma. I have certainly had performances I know should have gone better–wrong notes, bad intonation, missed entrances, bad rhythm or intonation, or just unmusical. As Orlick explained, great performers already intuit that we need to examine what happened and why because that feedback is critical to future performances. Do you need more practice focusing? Did you need to practice the hard technique more slowly? Did you need more time with a tuner? Are you not devoting enough time to internalizing a pulse and subdividing? Did you simply not devote enough practice time? There are innumerable things that could influence your performance, but it is your task afterwards to figure out what needs to change and what needs to remain in your regular practice. The important thing is that you didn’t succeed or fail because you made/let yourself feel badly after your last less than stellar performance. Perhaps you simply did not work hard enough. Ok. Own that. Then, without judgement, decide if it’s worth it for you to work more in the future and, if so, find a way to do so. If you remember from Bulletproof Musician, there is a difference between our focus in practice and in performance. In practice we balance playing with giving ourselves immediate feedback so that we can improve it in this practice session. This feedback should be judgement-free, emotion-free, and objective (no reason to be angry with yourself or to question your ability during a practice session). Separately, we need to practice performing without so much worry about feedback. In this performance mode, we learn to ignore that valuable feedback for the duration of the performance. More on this is coming. Mental Practice is my favorite! I am so excited for this chapter. OK, what does mental imagery look like for musicians? Our images don’t necessarily change drastically. But we do know how it feels to play musically and technically correct. I use this in 2 connected ways, for technique and for musicality. 1) I find mental imagery helpful for fundamental work. Have you ever known in the split second before playing a note (especially a high note) that it was not going to come out? That your preparation or transition was not what it should have been to make that note speak right away? Just as athletes mentally practice complex large movements, we can practice how it feels to produce the sounds we want. That we practice recalling that developed skill rather than learning a new one. This works for voicing, tonguing, resonance, or anything you want to apply it to. This is not in place of all the work we need to do actually on our instruments. But it’s a good extra tool. 2) My favorite way to use imagery, however, is for musical ideas. We spend some of our time forming our interpretation and then we need to practice re-creating it. In service of this, you can practice being able to recall on demand the phrasing and artistry you want. It is hard to replicate the musical ideas (dynamics, emotion, character, and all the elements within artistry) on our instruments, but almost impossible if we cannot do it first mentally. Pick a phrase you are working on. Imagine the phrase exactly how you want to perform it–not just the notes and rhythm, but also musical intention. Like the athletes Orlick quoted, you likely won’t be able to recall the phrase on demand if you have never tried anything like this before. That’s ok! Just like everything else, you need to practice it. But as you get better at it, your mental ability starts to be a better reflection of your real ability to perform the piece. If you can’t perform it mentally, that’s a pretty good indication that you don’t really know the phrase. Then, what is perhaps the other side of the same coin, imagine not just how you want the phrase to sound, but how it feels to create that. For me this practice is most noticeable in creating smooth intervals. Playing something like a Brahms sonata, with lots of long legato lines and sometimes tough intervals, I imagine feeling what it is like to play the phrase perfectly legato. This feeling includes how my air feels, how I am staying relaxed with my body, how my tone and phrasing sounds as I play, and any other details. I love the idea of using it for mistake correction. If something goes wrong (fingerings, partials, air support, or even loss of focus, etc), imagine executing the skill the way you want to before trying again. This helps give yourself a mental representation of how to play it correctly to draw upon when you then actually try it on your instrument. How much should we use mental imagery? One athlete suggested 15 minutes at least each day of mental imagery. I suspect it’s a bit different for us because we have so many varied skills and varied repertoire. I am most successful when I imagine each piece I am playing. Although, as Orlick says, doing this is great for my general ability to concentrate, being able to recall my interpretation of the Mozart Concerto does not really make me more prepared to recall my Brahms sonata interpretation. So I think it’s less about time and more about diversity and consistency of use. 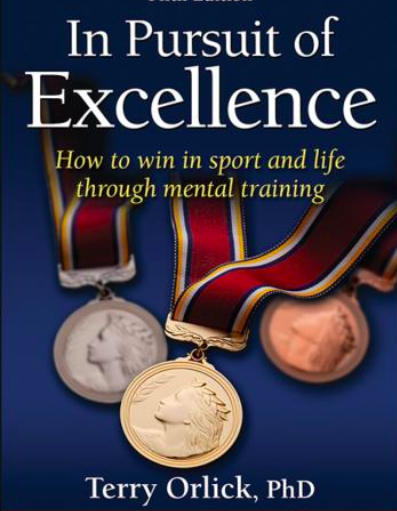 Mental imagery is for skill acquisition and execution in practice. It is teaching yourself to access and perform a skill, phrase, etc on demand. Mental simulation (coming up in chapter 11! )is great for practicing performance, like a mental dress rehearsal. The example with a figure skater is a great representation of dealing with performance anxiety. This is practicing the performance now that you have practiced the music. Have you ever been nervous but then felt better as you got into the groove of playing? That was likely because you switched from something you hadn’t practiced (walking on stage nervously) to something you had (your piece). So make your piece begin far before the first note. Imagine your next performance in detail from before you even walk on stage (backstage, in the audition warm-up room, in a dressing room, etc). Imagine what it looks like, how your clothes feel, the feel of your instrument in your hand. Imagine feeling nervous. Then imagine calming that anxiety, and walking on stage or into the audition room. Imagine the audience or judges as you walk in. Visualize the room and and taking your place calmly. Imagine preparing to perform by hearing your piece in your head, taking calming breaths, or whatever your normal start to the performance is. Imagine looking at a conductor, co-performer, or other signal to begin if appropriate. Imagine how it feels to do all this, then how it feels to play your piece exactly how you want it. However, like the archer your actual performance experience can differ slightly from that. You can practice the performance experience like the figure skater (or the example above). Or you can imagine walking on stage and making yourself feel like it’s just another time in the practice room where you know you can deliver the experience you want. I think these are similar procedures stemming from the same skill of being able to focus and access acquired skills under performance pressure. So I think anything that you practice with that experience in mind can be helpful. A lot of this is easily applicable. I want to stress though that I think this is incredibly valuable for physical health as well. Musicians can put our bodies through a rigorous day the same way athletes can. But athletes have a coach to watch their physical form. We have a lot less feedback about staying relaxed in the countless hours we spend in the practice room. Training yourself to be aware of tension is, as Orlick explained, valuable for performance. But I find it also valuable for keeping my playing free from tension. I often tense for difficult technique or when I am feeling emotionally frustrated. Being relaxed and being able to monitor your body are also great for technique form. This allows you to activate the muscles needed for embouchure or bow stroke or any other aspect of playing while keeping everything else relaxed. Again, this is good for physical health and longevity of career, but also for sound production. We resonate with our whole bodies so introducing tension (rather than activation) can literally upset the balance of our embouchure or more subtly change our tone by not allowing full resonance. Tongue tension affects tonguing speed, sound quality, voicing, and more. Hand tension limits our technique. If you play with tension, you will eventually plateau in these aspects of your technique. Orlick clearly gives examples of how to use this for performance, performance anxiety, sleep, etc and I love all of those. But I think integrating this into regular practice for us is also beneficial. Try to integrate some kind of check-in routine during practice sessions where you purposefully think about your whole body. I might fit well during a break (so you actually relax your body during that break). I recommend doing it as part of fundamental practice. Take a moment to practice deliberately relaxing or activating the appropriate muscles in a few long tones or a gentle scale. Just like we practice being in tune, playing with a good tone, or any other fundamental, we can practice being (and thinking about being) relaxed. This is important for health and stamina across years of practice. It is also important because tension affects our playing at elite levels. Tension anywhere affects our sound because we resonate with our whole bodies. I most obviously applies in my work on Black Dog. It was not possible for me to get consistently fast enough with the tension I discovered through these exercises. The balance between controlled technique and complete muscle relaxation is tough to find. I could not have found it without the training I’ve already done in body relaxation, meditation, and practicing precise body awareness. Let me know if you have any thoughts or questions below. When you are ready, check out the rest of part 2 (chapters 10-14) here.